Sticking to a Mediterranean style diet might slow down aging finds the EU funded project NU-AGE. At a recent conference in Brussels, researchers presented that a NU-AGE Mediterranean style diet, tested in the project, significantly decreased the levels of the protein known as C-reactive protein, one of the main inflammatory marker linked with the aging process. Another positive effect of this diet was that the rate of bone loss in people with osteoporosis was reduced. Other parameters such as insulin sensitivity, cardiovascular health, digestive health and quality of life are yet to be analysed. “This is the first project that goes in such depths into the effects of the Mediterranean diet on health of elderly population. 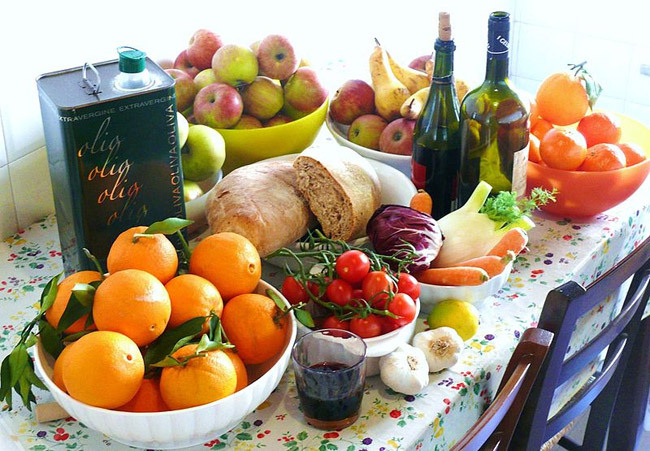 We are using the most powerful and advanced techniques including metabolomics, transcriptomics, genomics and the analysis of the gut microbiota to understand what effect, the Mediterranean style diet has on the population of over 65 years old” said prof. Claudio Franceschi, project coordinator from the University of Bologna, Italy. A new personally tailored, Mediterranean style diet was given to volunteers to assess if it can slow down the aging process. The project was conducted in five European countries: France, Italy, the Netherlands, Poland and the UK and involved 1142 participants. There are differences between men and women as well as among participants coming from the different countries. Volunteers from five countries differed in genetics, body composition, compliance to the study, response to diet, blood measurements, cytomegalovirus positivity and inflammatory parameters. NU-AGE’s researchers also looked at socio-economic factors of food choices and health information as well as the most significant barriers to the improvement of the quality of a diet. As with biological markers, considerable country differences were seen when comparing several aspects, for instance on the overall nutrition knowledge. In France and the UK, over 70% of participants thought they had high nutrition knowledge while in Poland only 31% believed so. Also, when elderly people buy food products, there are country differences in the attitudes towards nutrition information on the food labels (what is important for a person from Poland, may not be as important for a person from Italy). In addition, participants from different countries understand and trust nutrition claims differently. Participants from the Netherlands and the UK appeared to understand nutrition claims better than participants from France, followed by those from Poland and Italy. In terms of trust, over 40% of Italian participants thought that nutrition claims on food products are reliable, while only 20% of British participants had the same opinion (on reliability of these claims). Surprisingly to experts, no gender differences were observed in nutrition knowledge between men and women. “The NU-AGE conference was a great success and allowed us to share the most recent results of the project as well as decide on the next steps and future work,” concluded Franceschi.